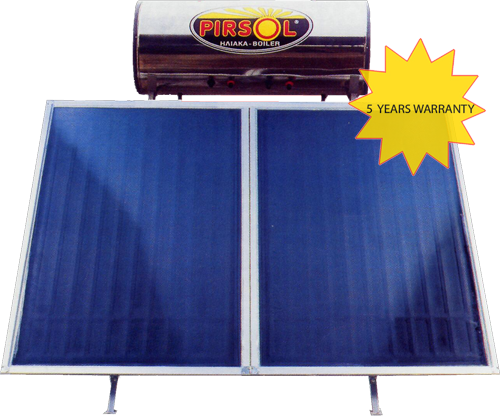 The solar water heater PIRSOL has the form shown in the photograph and is available in 3 types. Constructed from 3mm thick carbon steel sheet and able to withstand the water pressure of the piping system. The inside surfaces are coated with bonded enamel to provide complete corrosion protection.The boiler is also cathodically protected through the use of magnesium bars to prevent galvanic reactions. The insulation is 7 cm thick polyurethane to keep the water hit over 48 hours. The boiler can operate connected to the central heating system or with solar or electric power. Constructed from 1mm thick DPC carbon steel sheet. The design accounts for both sides of the panel connected in a way that allows the free flow of water in the closed circuit with crossing over piping routes. The cell surface structure, the electrostatic process, the black paint (type MAT) and the 250° C heat treatment ensure the complete absorption of solar energy and its conversion into heating energy with natural circulation. The panels are elastic to the temperature changes. 4. Skid and parts of electrostatically painted 3 mm thick piping. As treated, the parts are in position to combat any strong wings and the sea spray of the coastal areas.